Frank's natural products are manufactured with the most modern technology and under constant quality control. But that's not all. 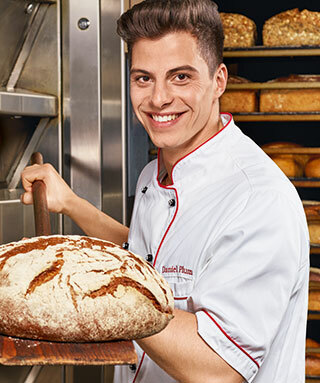 Our experienced and careful employees, who put their heart and soul into the production of Austrian specialities every day, provide that special extra. Because the most important thing is that it tastes good. And no machine can judge that. For one litre of original Styrian pumpkin seed oil about 2.5 kg pumpkin seeds of the variety Cucurbita pepo var. styriaca are pressed. This shellless pumpkin seed species grows preferably in Styria and parts of neighbouring Austrian provinces. Only high-quality pumpkin seeds are ground and kneaded with water and salt under the supervision of our experienced press masters. The roasted product is heated for 60 - 80 minutes until the water evaporates. Finally, the roasted ground material is put into a punch press. At a temperature of approx. 90°C and a pressure of 300 bar, the real Styrian pumpkin seed oil is obtained by initial pressing. By maintaining gentle processing conditions, the pumpkin seed oil acquires its typical velvety green colour, the inimitable aroma and the unique, tender nutty taste.